Here are the directions for Boro coaches and attending KCOM Stadium in Hull HU3 6HU this weekend. Parking is close to the stadium and the maps and written instructions show how to get to the spaces. The route is clearly signposted to the stadium off the A63. Travel M1, A1/A1M, M18, and M62 east. Travel M62 to its end and join the A63 to Hull. Travel A63 for approx’ 13.5 miles and exit slip road marked, Local traffic/Infirmary, this slip road is just after you enter the 40 mph limit and before the Daltry Street flyover (building for point of reference – Smith and Nephew). Follow slip road to the roundabout and take the 2nd exit, which is Rawlings Way. Follow Rawlings Way to the main traffic lights and turn left onto Anlaby Road (A1105). Travel along Anlaby Road for approx’ 0.75 miles and over the flyover to the traffic lights at the bottom. At these lights turn right into Walton Street. The stadium at this point is on your right set in the parkland. Turn right onto Walton Street and after the park entrance (Airco Arena) take the 5th entrance on your right (Opposite the New Walton club) into the Walton Street car park, car park stewards will greet you and will walk in front of your coach to guide you to the visiting coach parking area. Travel M62, A63 and then follow directions as from South. Travel A1/A1M, M62, and A63 then follow directions as from South. 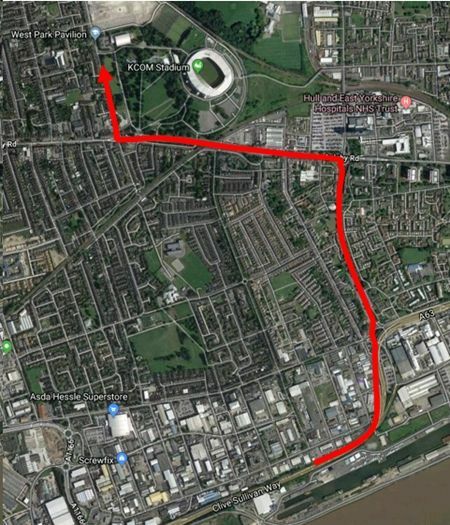 Please note as this area is the accommodation area for Hull Fair, there is a strict 5mph speed limit, children and animals are in this area, which could step/ run out from between the accommodation units. 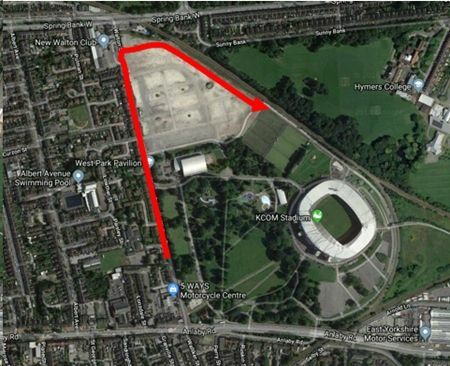 This is area is also strictly no public pedestrian access, occupants of the coaches cannot disembark until in the coach compound at the stadium. Please note there is a coach and minibus fee for each vehicle, payable on arrival. Car drivers are warned that Walton Street car park is closed. The Carnegie parking area in West Park is also unavailable . Supporters who usually park on the Walton Street car park are advised to explore alternative options including the Stagecoach Park & Ride service from Priory Park and other public transport options or city centre parking. The park and ride bus picks up every few minutes outside the stadium. Priory Park and Ride is signposted off the A63 on the western aproach to the city. There also lots of reasonably priced multi storeys in the centre. Fans are advised to allow extra time for their journey.